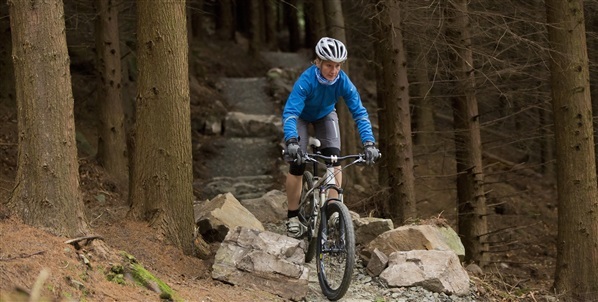 We reckon Northern Ireland's mountain bike trails are at their best in autumn so why not throw on that extra layer, breathe in the cool crisp air and embrace the elements this month! 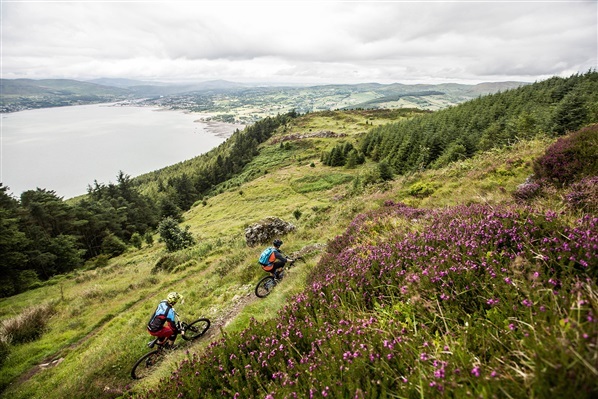 On the shores of Carlingford Lough (1hr 30min from Dublin), Rostrevor is regarded by many as the 'Home of Irish Downhill' however with over 45km of challenging (both technically and physically) red and black trails this place has also now become an iconic cross-country venue. Easier going than it's sibling trail centre in Rostrevor, Castlewellan (1hr 45min from Dublin) boasts a range of trail grades for all abilities from family-friendly green and blue trails to a 19km red trail packed full of technical trail features including two optional black descents. Surprise package Davagh Forest (2hr 30min from Dublin) is a hidden gem in the Sperrin Mountains. 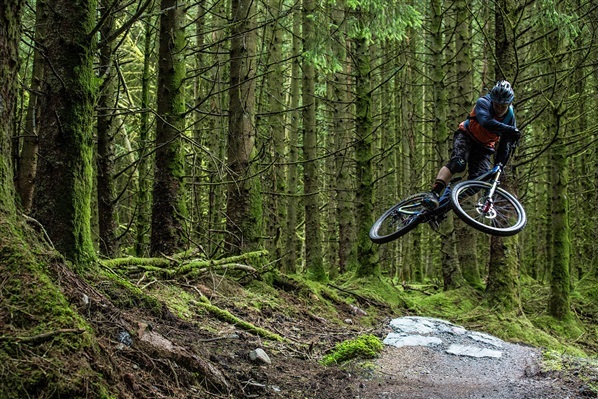 This place is all about flow so if you like fast, swoopy, red singletrack then Davagh Forest is for you! There are also green and blue trail options for younger and/or less experienced riders. 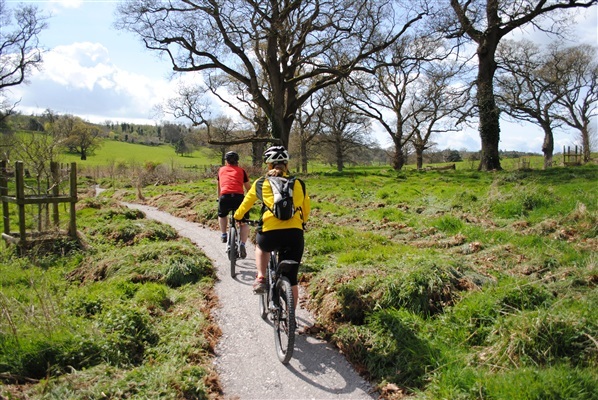 Located in Fivemiletown (2hr 15min from Dublin) the Blessingbourne Trails are split by a quiet road with gentle blue trails on one side and a fast, bermy red trail on the other! This is a perfect location for families or groups of friends with a range of mountain bike abilities. 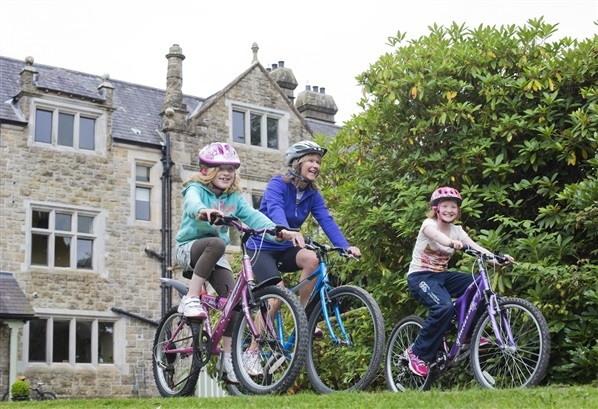 Another ideal family mountain biking destination is Castle Ward (2hr 15min from Dublin) on the shores of Strangford Lough. Owned by the National Trust, Castle Ward offers beginner-friendly green trails as well as a flowy 13km blue trail with stunning views. 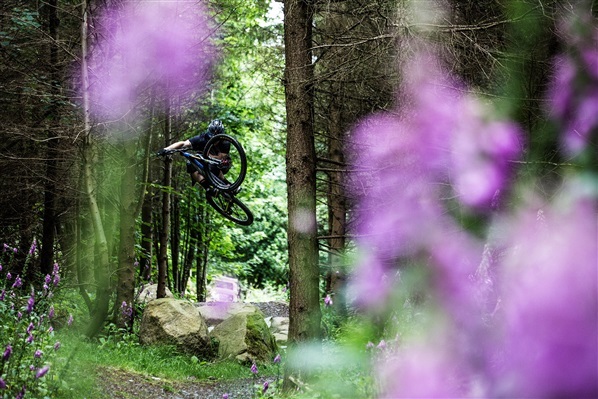 Located on the outskirts of Belfast (1hr 45min from Dublin) Barnett Demesne offers a mix of green, blue and red grade mountain bike trails as well as Northern Ireland's only official jumps park. This is a perfect MTB addition to a Belfast City Break. Visit MountainBikeNI.com for loads more information on any of these MTB locations and more across Northern Ireland including official bike hire providers and MTB-Friendly places to eat, drink and stay near each trail centre! Blustery days on the beach, crisp fresh air and roaring log fires – autumn is a fantastic season for a walking break on the North Coast. To make the most of this colourful time of year we have teamed up with walker friendly accommodation to provide some great walking break offers in the best walking locations throughout Northern Ireland. Valid from Sept - Nov (T&Cs apply visit WalkNI for more details) all you have to do is contact the accommodation providers directly and quote ‘WalkNI’ to book. Expect spectacular views along this breath-taking 12-mile linear route following part of the Causeway Coast Way. 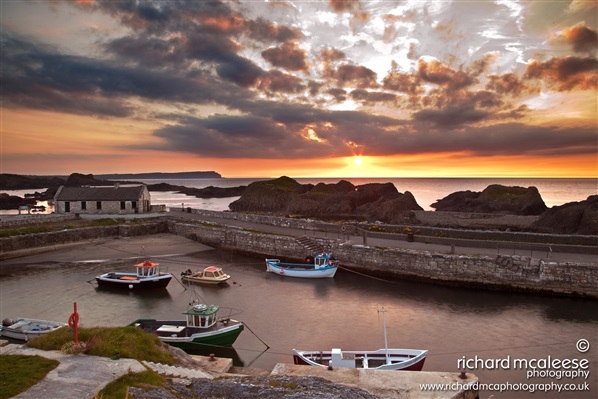 Starting at Ballintoy Harbour which you may recognise as the quay of 'the Iron Islands' from Game of Thrones. Passing beach, cliff and castle there is plenty to admire along this coastal route. From the stunning White Park Bay to the picturesque hamlet of Portbradden and the ancient Dunseverick Harbour, the cliff top path provides some of Ireland’s most stunning views. Peer down at Portmoon Salmon Fishery and stand at the highest point of Hamilton's Seat between Benbane and Bengore is Hamilton's to witness superb views. You’ll also reach the Giant’s Causeway approaching it from a whole new angle before following the old Bushmills railway track back to your accommodation for the night. Nine 4 star self-catering cottages and two barn lofts with unrivalled views over the Giant’s Causeway, the sleepy seaside village of Portballintrae and the sweeping Donegal Coastline beyond. 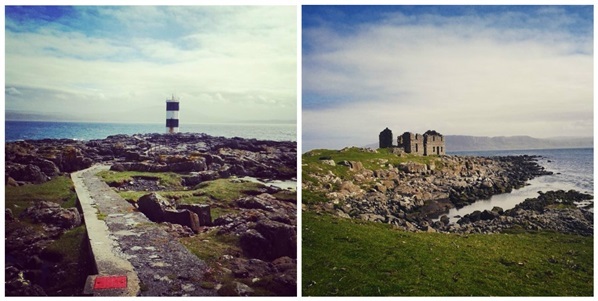 With nearly 20 miles of walks on Rathlin to enjoy featuring lighthouses, rock stacks and commanding views across the Atlantic you’ll be spoilt for choice. Situated 6 miles off the North East coast and accessible by ferry from Ballycastle, this tranquil island will provide you with magnificent views of Donegal, the North Antrim coastline, the island of Islay and the Mull of Kintyre in Scotland. The Ballyconaghan, Kebble Cliff Walk, Kinramer North Walk, Kinramer Trail, Rathlin Trail and Roonivoolin Walk are all fully way marked making it easy to navigate and explore this unique island. Self-catering located only 300 metres from Ballycastle beach. Featuring 4 bedrooms with stunning views across Ballycastle golf course and the bay. Located on Ballycastle seafront and only 4 minutes walk from the Rathlin Island ferry terminal this hotel features ensuite bedromms many with sea views as well as an onsite bar and bistro. 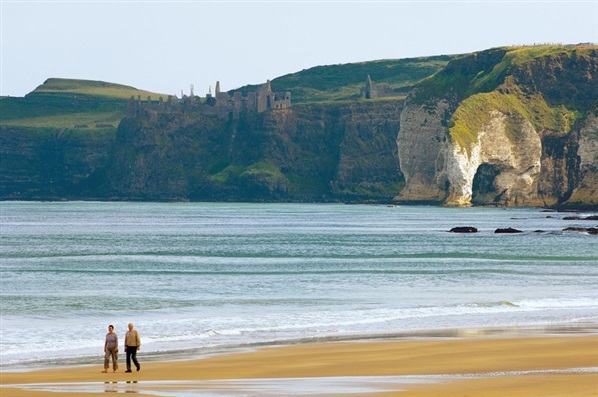 A long, sweeping beach and a medieval castle are sure to impress on this 6 mile section of the Causeway Coast Way. Starting from Portrush harbour you’ll take in the view point at Ramore Head with Dunluce Castle clearly visibile on the cliff top to to the east. You’ll walk along the sandy shores of East strand before reaching the striking limestone cliffs of White Rocks. Perched spectacularly on a rocky promontory high above the sea, medieval Dunluce castle awaits before you reach the village of Portballintrae. If you want to continue your walk the Portballintrae Causeway Loop is an ideal addition. Situated just one mile from Portstewart’s Victorian-era seafront Promenade, expect a warm welcome and a cup of something hot at this family run B&B after a day stretching your legs. 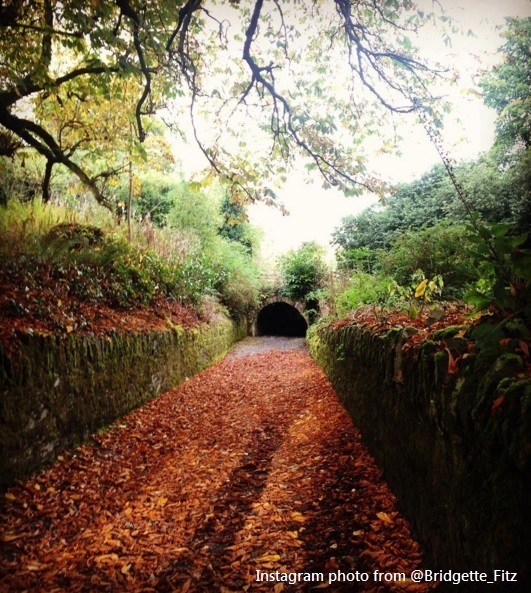 Are you brave enough to take on Northern Ireland's most haunted walks this Halloween? Dating from the time of the Plantation of Ulster, the demesne at Springhill boasts a rich mixed woodland planted by generations of the Lenox-Conyngham family who lived here for over three hundred years. Once described as ‘the prettiest house in Ulster’ Springhill has a spooky past. Without doubt Springhill’s eeriest section is the blue-room accessible via tours of the house. Some say you can feel the temperature drop as you enter the room alluring to the fact you may not be the only ones present! It was here that resident at the time in 1814, Lenox-Conyngham, was recorded as killing himself with a shot to the head. It is said that the ghost of his wife Olivia can still be seen futilely running to the room to prevent her husband’s death. 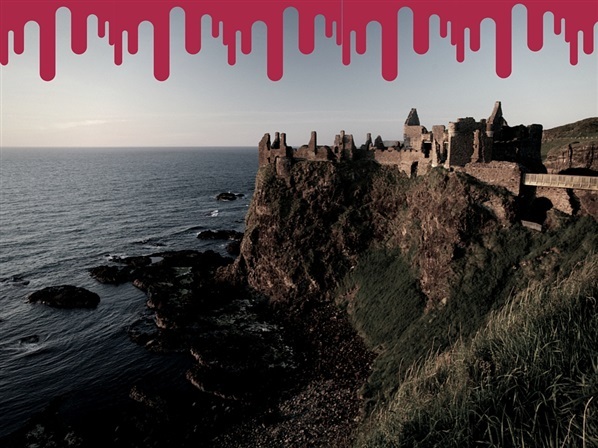 This short but spectacular walk around Dunluce Castle, dating back to the late 15th or early 16th century has plenty of ghostly history sure to get you into the spooky mood. Dramatically located on the edge of a basalt outcropping and one of the most identified landmarks on the Causeway coastline the roofless ruins are breath-taking especially at dusk and provide spectacular views of the coast. According to legend in the severe winter of 1639, during a banquet, the castle's kitchens collapsed and fell into the sea taking with them most of the servants. It is said that the ghostly screams of the kitchen servants can still be heard on stormy nights as they forever fall to their doom. However this wasn’t the only tragedy to have taken place at the site. Maeve Roe, the only daughter of Lord McQuillan is also said to have met her death in the castle after tripping on the hem of her wedding dress and falling out the window as she tried to elope with the man her dad refused her to marry. It is said on blustery days visitors can hear her calling for her absent lover. If you haven’t been scared off, you can continue your walk along the Causeway Coast Way. 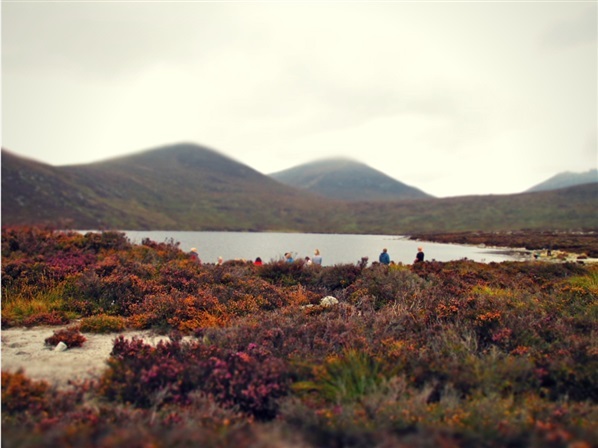 A great walk for those looking to build in distance without too many ascents this mountain ramble follows the 'Banns Road' and circles Lough Shannagh, the largest natural body of water in the Mourne Mountains reaching a high point of 587m at Carn Mountain. The Lough is also known as the ‘Lough of the Fox’ after a supposed tragedy occurred many years ago…There was once a great hunter called Sheelagh, the daughter of one of the Clan Chiefs. On a hunt in the area she broke away from the rest of the hunt and chased the fox into the high Mournes. The mist closed in and the fox ran straight into the lough where she followed only to see the fox disappear. She tried to find a way out of the lough, only to get deeper and deeper in until she died, with her horse, sinking to the bottom. The rest of the hunt were said to have searched in the mist for many days but never found her. Apparently, when the mist closes in, the woman can still be seen haunting the lough; on her horse. 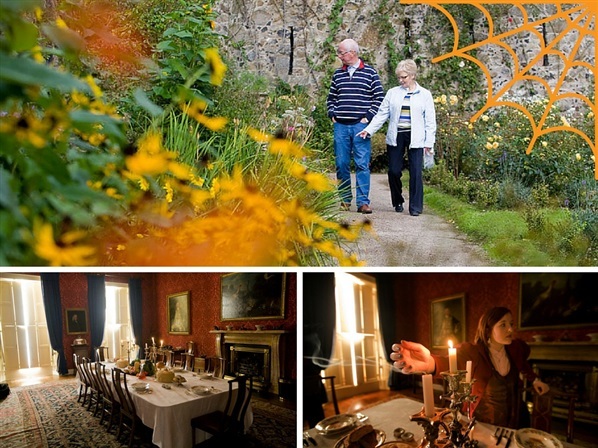 With a whole host of old buildings and native woodland providing a haven for all eight species of bat found in Northern Ireland, make sure you don’t miss out on visiting this stunning estate during October before it closes for the winter at the end of the month. 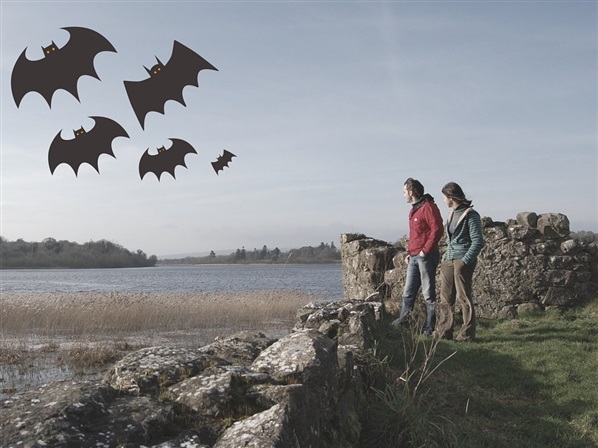 Take this 4.2 mile circular walk and get into the spooky spirit on your very own bat hunt within the 2,000 acre demesne. The route will take you through the parkland towards the Old Castle; built in the early 17th century it survived two sieges before being destroyed by fire in 1764. Despite this the ruins still remain as a stunning spectacle today. You’ll also encounter Crom’s famous Yew Trees – an impressive conjoined pair of male and female English yew with a combined circumference of 115m, a walled garden and woodlands featuring a rich haven of wildlife as well as the estate's summer house, old sawmill and turf house. This short circular walk uncovers the fascinating history of the popular coastal town of Donaghadee, once the main shipping port between Ireland and Scotland. It also passes Grace Neill’s pub, which claims to be the oldest pub in Ireland dating back to 1611, where many believe the ghost of Grace herself still resides – apt then for a Halloween Wander! 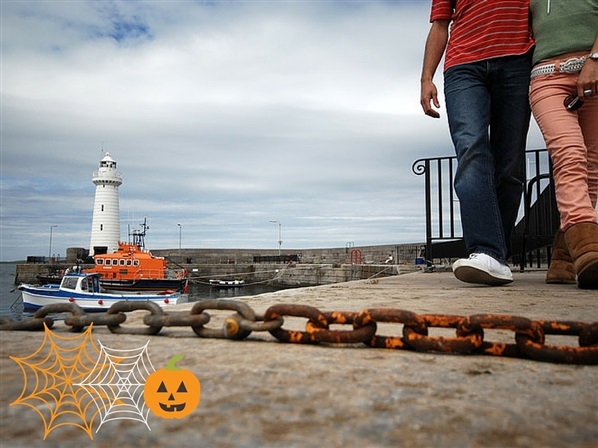 The first landmark you will see on this walk is the Donaghadee Lighthouse, constructed in 1836 it was originally lit by 45,000 candles. Moving into the old quarter of Donaghadee, the street names are a nostalgic reminder of the industries which once thrived here for example Saltworks Street, Gas Works Street and Railway Street. The walk also passes the Moat. Although it looks like an ancient castle, the Moat was actually built for storing gunpowder while the new harbour was being constructed. It's at this time of year that all us 'Northerners' get very jealous of you 'Southerners' with your generous October Bank Holiday Weekend on the horizon. So do us all a favour and MAKE THE MOST OF IT!! 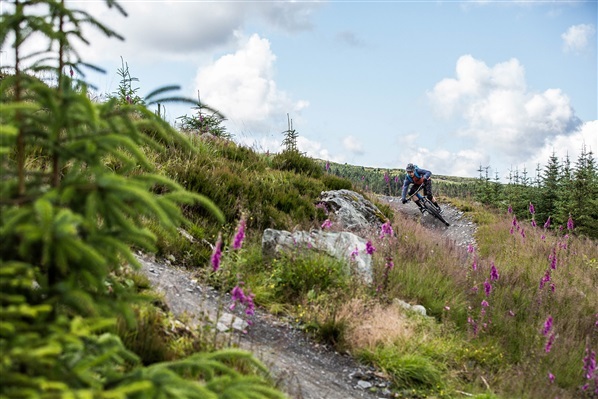 Why not throw your bikes in the car and check out some of Northern Ireland's spectacular new mountain bike trail centres?! We'll all be thinking about how you're getting on from our stuffy offices on Monday!! 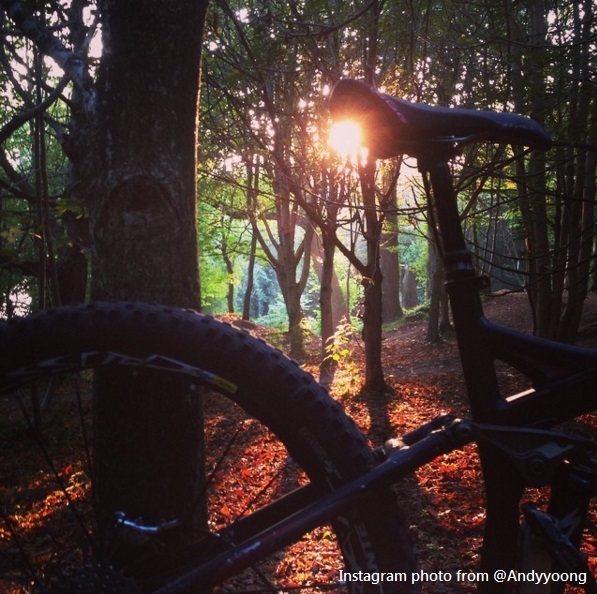 Here's a quick snapshot of what Mountain Biking in Northern Ireland has to offer! ENJOY!! 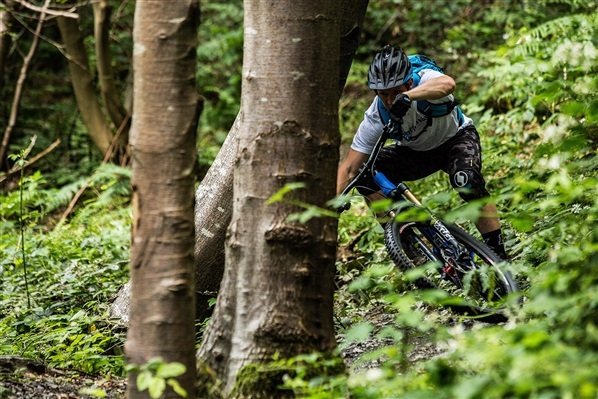 Located on the outskirts of Belfast (1hr 45min from Dublin) Barnett Demesne offers a mix of green, blue and red grade mountain bike trails as well as Northern Ireland's only official jumps park. 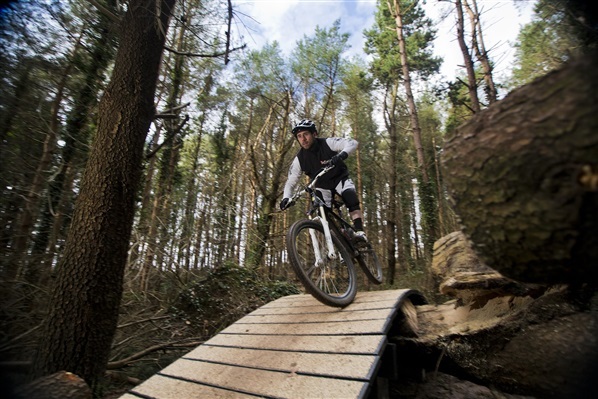 This is a perfect MTB addition to a Belfast City Break this Bank Holiday Weekend! With Halloween creeping around the corner it's time to find out what spooktacular outdoor events are on offer across Northern Ireland. Whether it be an action packed family day out with your wee monsters over half-term or terrifying scares with your friends, prepare to add a spooky twist to your next adventure this October. 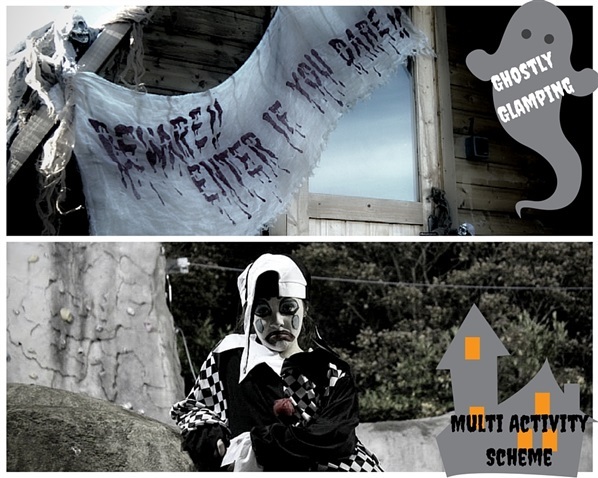 With a frighteningly good 3 for 2 offer on all activity packages, this is a not to be missed family day out! Have a go at a wide range of activities including, high ropes, zip lining, archery and canoeing/ kayaking. After a day of terrifyingly terrific activities toast some marshmallows on the bonfire before camping out under the stars in the ghostly glamping cocoons, perfect for those who like the idea of camping without the soggy tent! Suitable for kids aged 6+. Avoid them turning into square eyed zombies in front of the TV during the holidays! During this full or half week of action packed fun in the great outdoors your wee spooks will have a blast learning new skills, making new friends and exploring. Suitable for children aged between 8 & 12 years old activities will include; orienteering, mountain biking, team building, climbing and more. Does the thought of being high above the ground send ghostly shivers down your spine? 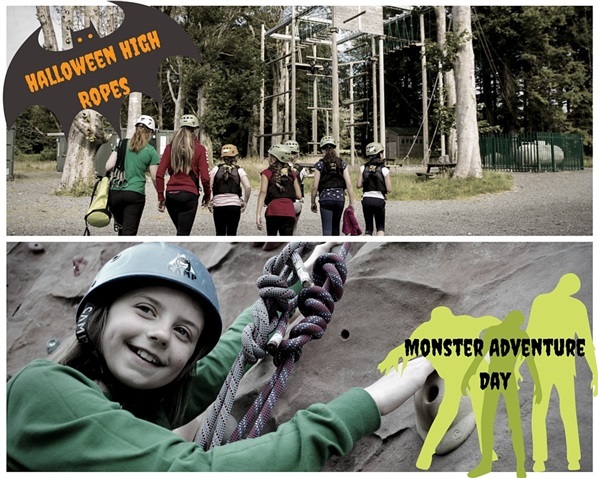 Take your family time to a whole other level this Halloween on the high ropes course at Tollymore. Work together to make it to the top of Jacob’s ladder and navigate your way around the obstacle course under the watchful eye of your instructor. Suitable for kids aged 10+. Suitable for wee monsters aged between 8 and 15 years old this is one action packed adventure day they won’t want to miss. Discover Castlewellan lakes hidden island during a canoe/ kayak session, take aim during an archery lesson, reach new heights on the climbing wall and navigate out of one of the world’s largest hedge mazes. With full professional instruction and staffing throughout the day along with all specialist equipment drop them off for what is sure to be a spooktacular day. Dress up in your Halloween costumes and head off on a high speed boat ride under the light of the full moon. 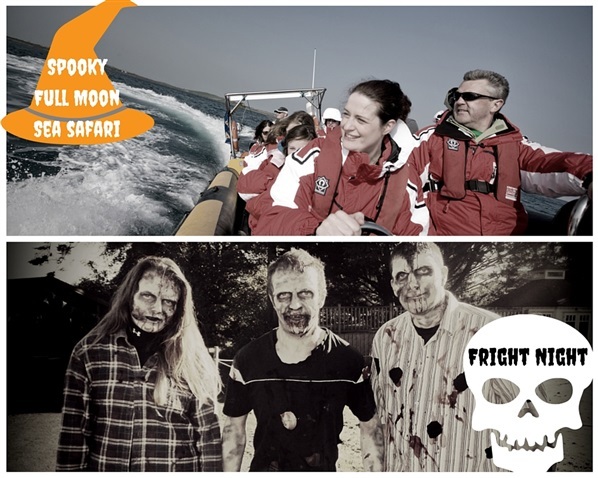 This special edition of the popular sea safari will feature some spooky history about Strangford Lough and Halloween treats for the kids! Suitable for kids aged 3+. Have a frighteningly great Halloween! !